Hoops boss says 'it doesn't help us if someone gets banned' from Hampden showpiece. Celtic manager Ronny Deila hopes Josh Meekings is allowed to play in next month's Scottish Cup final as he expressed sympathy for the Inverness defender's plight. 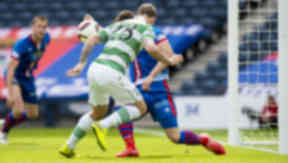 Meekings faces a judicial panel hearing after rejecting the Scottish FA compliance officer's offer of a one-game ban for deliberate handball during Sunday's Scottish Cup semi-final. 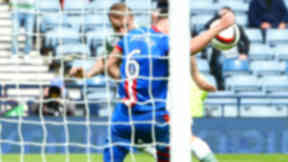 The Inverness man stopped Leigh Griffiths' header in the first half of the match as the Highlanders came back to win 3-2 and end Celtic's treble hopes. Earlier this week, Celtic wrote to the Scottish FA to seek "an understanding" of the failure to penalise the player. 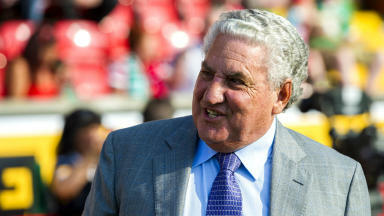 "I don't think he did it on purpose, the ball was going very quickly. "It was reaction, but it was a clear hand ball, a red card and a penalty. "I hope that he will play, the best players should always play in the final. "I don't think it is a positive thing to ban anybody." Asked about how he reacted to Sunday's loss at the national stadium, Deila joked he had "looked at the wall - and some television" before explaining the real impact of the day. He said: "It was the toughest day in my career on Sunday, I have to admit that. "It was very tough. I really wanted it (the treble) and I think we had a very good opportunity. "So Sunday and Monday was very, very tough but now it has gone. "I just want to keep on winning games and get that league title to Celtic Park." 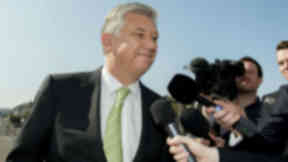 Celtic chief executive Peter Lawwell spoke to STV's Grant Russell ahead of a meeting of all 42 SPFL clubs at Hampden. He said: "Probably everyone preferred this not to happen. "The unfortunate consequence is we are now going through this process."